According to studies, people who never apologize can't deal with "feeling" bad, ashamed, responsible or vulnerable. Even more alarming: the non-repentant "feel" happier than those who repent! So we must ask ourselves: Are we more interested in feelings or facts? No one likes feeling bad, ashamed, responsible, or vulnerable, but sometimes we're all of those things. God expects us to repent even if we were only 10% wrong and the other person is 90%. That's because repentance maintains a healthy relationship with the Lord and restores our confidence and hope. The non-repentant feel "happier" only because they're self-deceived. Genuine repentance refreshes, restores, and changes us. It brings Christ-lovers factual happiness and joy. 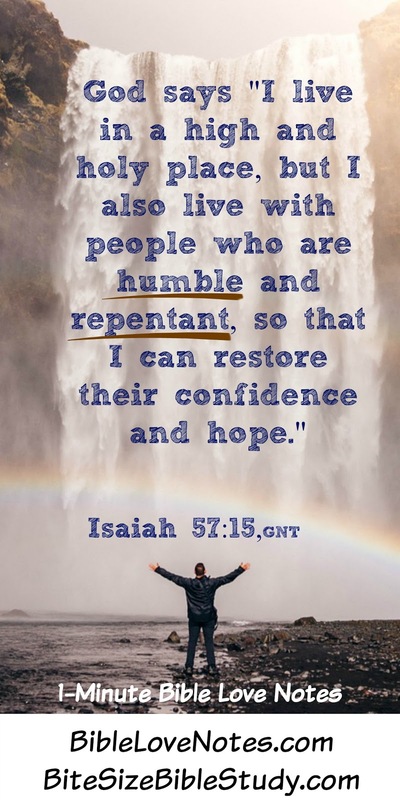 Isaiah 57:15: For this is what the high and exalted One says-- he who lives forever, whose name is holy: "I live in a high and holy place, but also with the one who is contrite and lowly in spirit, to revive the spirit of the lowly and to revive the heart of the contrite." James 4:6-10: “God opposes the proud but shows favor to the humble.” 7 Submit yourselves, then, to God. Resist the devil, and he will flee from you. 8 Come near to God and he will come near to you. Wash your hands, you sinners, and purify your hearts, you double-minded. 9 Grieve, mourn and wail. Change your laughter to mourning and your joy to gloom. 10 Humble yourselves before the Lord, and he will lift you up. We are supposed to confess our sins to God and to others - those we offend and those who keep us accountable. Luke 17:3: So watch yourselves. "If your brother or sister sins against you, rebuke them; and if they repent, forgive them."